Continuing on from the previous post, it’s time to take a look at the customization requirements that brought about the creation of a custom bootstrap process for our desktop installations. The customization capabilities within the Expert product are extensive, they support changes to the domain model, business process and user interface. Many of these changes result in the need to deploy custom assemblies to the workstations running the Expert applications. If the out-of-the-box ClickOnce manifests were used to manage these changes, they would need to be updated by the customization process. Instead of doing this, we chose a solution similar to Google Chrome and created our own bootstrap mechanism to manage updating the client software. The ClickOnce infrastructure is used to ‘install an installer’. I’m not going to drill into the bootstrapper, Pete has already discussed some of the performance aspects here. Instead we’ll walk through the process of creating an MSI to replace the ClickOnce based installation. The first thing to note is that WiX is a free, open source toolkit that is fully supported by Microsoft. It does not ship with any Visual Studio version and must be downloaded. The current version, and the version I used, is v3.5 though there is a v3.6 RC0 available. The actual download of the bits is available from CodePlex here, the SourceForge site links to this. Deployment Tools Foundation (DTF) – a managed library for programming against MSIs. In addition to the WiX Toolkit, another tool to have is Orca which is available in the Windows SDK. 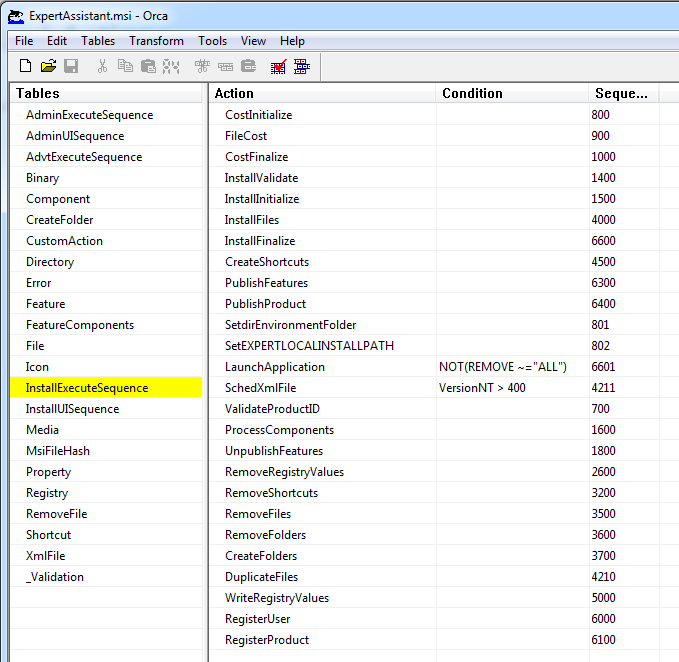 Orca is an editor for the MSI database format, allowing an MSI to be easily inspected and edited. This did not work for me. Instead I downloaded and installed the MSI from the CodePlex site. You can add the set-up project alongside the project containing the source code and maintain the whole solution together – installation should not be a last minute scramble. The obj/Debug subfolder will contain the generated wxs file and the wixobj files compiled from them. The bin\Debug subfolder is the default location for the MSI. 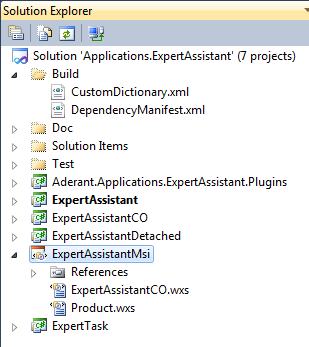 The two files of interest are the ExpertAssisantCO.wxs, which contains the files from the referenced ExpertAssistantCO project and the Product.wxs which contains configuration information for the installation process. 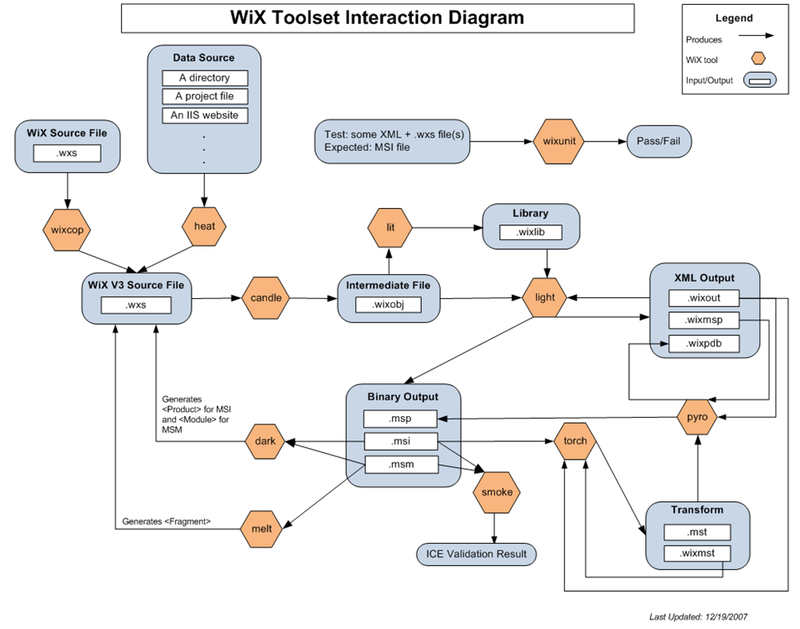 Building the project will invoke the WiX tooling: candle, preprocesser that transforms .wix into .wixobj, and light, processes wixobj files to create an MSI. Of course, the out-of-the-box experience can only go so far and so the generated WXS likely needs to be augmented. Our approach was to use HEAT (via the Harvest option) to generate the initial WXS files and then the generation was disabled. 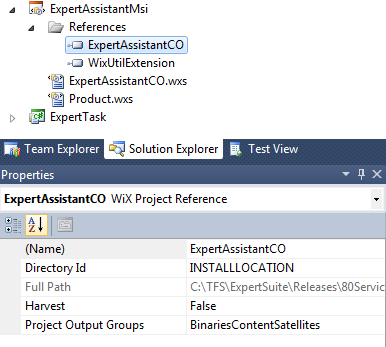 The ExpertAssistantCO.wxs file was moved into the project for manual editing and the product.wxs file contains the bulk of the custom code. The generated code has been changed to specify an explicit GUID and to set the KeyPath attribute. The actual GUID has been replaced with ?s, the KeyPath attribute is used to determine if the component already exists – more here. The shouting INSTALLLOCATION is an example of a public property, in the MSI world public properties are declared in full uppercase. The directory the file will be installed into is declared in the product.wxs file and referenced here. The $(var.ExpertAssistantCO.TargetDir) demonstrates a pre-processor directive that allows VS solution properties to be accessed, in this case to determine the source location of the file. The generated referencedProject.wxs file contains each file declared within a component and then logical groupings for the components. The more interesting aspects of WiX belong to the product.wix file. This is where registry keys, short cuts, remove actions and other items are set-up. A drill-down into the various extension schemas is provided here. The utility extension referenced above allows Xml file manipulation which we will see later. The requiredVersion sets the version of WiX we are depending on to compile the file. The attribute worth calling out here is the InstallScope. This can be set to perMachine or perUser, setting to perMachine requires elevated privileges to install. We want to offer an install to all users without requiring elevated privilege and so have a per user install. This has implications later on when we have to set-up user specific items such as Start Menu shortcuts. The first three properties are custom public properties defined for this installer, public properties must be declared all upper case. A public property can be provided on the msiexec command line or via an MST file to customize the property value. Other ARP properties can be found here. The final property WixShellExecTarget specifies the file to be executed when the install completes. This is a required parameter of a custom action that we will come to later. 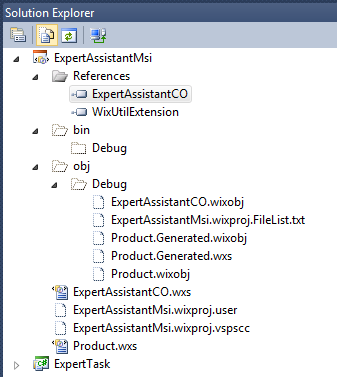 The [#filExpertAssistantCOexe] is a reference to a file declared in the ExpertAssistantCO.wxs file. Next up we come to one of the areas that stumped me for a while, how to set a property value. Some attributes can directly reference a property by surrounding the property name in  and have the value swapped in, e.g. A final property that is set is the EnableUserControl, which allows the installer to pass all public properties to the server side during a managed install. Note: the preferred approach is to set the Secure attribute individually to Yes on each property declaration that supports user control (I have only just learnt this while writing up the posting). A final element for this post is Icon which specifies an icon file. The icon Id was used by the ARPPRODUCTICON to set the icon seen in the install programs control panel. There’s more to come, however this post has become long enough in its own right. 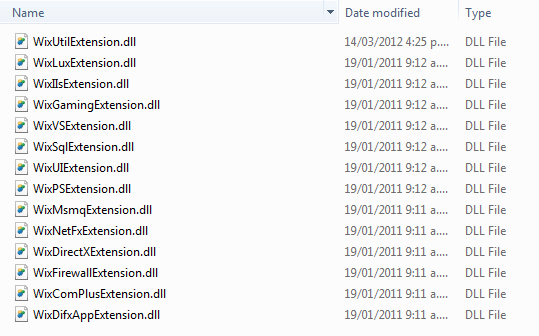 In the next post I’ll drill into setting registry keys, determining the install location, Start Menu settings and more.